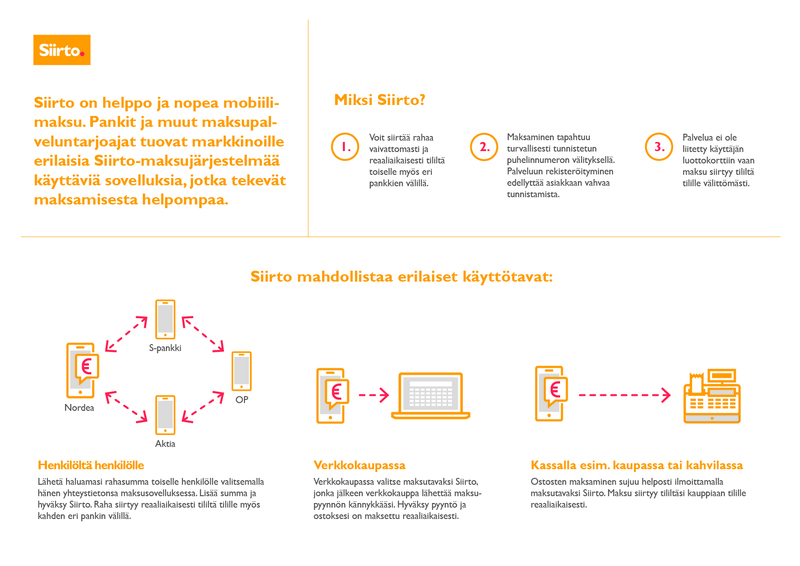 Automatia has started to offer Siirto mobile money transfer infrastructure in Finland. Siirto brings real-time money transfer to consumers and merchants. Siirto is a new service that enables real-time money transfer from a bank account to another bank account, directly from mobile. It works between consumers, and also in the internet stores and at the point of sales. Nordea, OP and S-Pankki have already implemented Siirto transfer in their mobile apps. Other banks will probably soon follow. You want to transfer some money to your friend. Open banking app (e.g. Nordea Mobile Bank) and select the recipient from your phones contact list. Enter the amount of money, and confirm the transfer with your app PIN. Your friend will get notification to his banking app that money is received from you. If your friend has not yet activated Siirto he or she will receive a SMS with instructions to install the app first. Service requires strong authentication of the customer during the first-time use. For the next transfers user does not need to authenticate. User just confirms transfers with the personal app PIN code. For consumers money transfer is free of charge. Siirto is also available for online store payments. User gets notification to his or her phone (via SMS or directly to the app) and confirms the payment with the app PIN. Some internet payment services provides, such as Paytrail/Nets, have already implemented Siirto into their services. For point of sale, service works similar way. Also NFC-enabled payment terminals can utilise it with mobile phones. Money is transferred instantly after PIN confirmation. POS payment solutions will integrate it as payment option in the futures. Details on pricing for merchants is not yet available. Automatia who runs the basic infrastructure is owned by Finnish banks. It operates and develops the pooled and shared ATM and deposit ATM networks in Finland. All the local banks are Automatia customers. Developers can utilise real-time money transfers in internet services by integrating APIs. Software company Tieto is implementing the ecosystem APIs and services on top of Automatias basic infrastructure. At the time of writing, details of offering and pricing was not available. Similar P2P consumer services have been around for quite some time in many countries: for example Facebook Messenger Payments in the US and Danske MobilePay in Nordic countries. I am sure Siirto will make much appreciated service by many consumers because it works with multiple banks and accounts. What comes to more business critical use cases, I would expect real-time money transfer coming soon to financial management services, such as B2B transactions, as well as employee salary payments. We at Salaxy are very excited of Siirto and we are following closely how it evolves!